The hotel has 172 rooms, each room looks out on the serenity of the tropical gardens and pools from each private balcony. The Deluxe rooms in Tamarind Wing have both Queen size bed and one single bed / The bathrooms have a separate bathtubs and showers. The ground floor rooms of Tamarind Wing have a very popular direct patio access to the swimming pool. The entire top floor is Non-Smoking. The One and Two Bedroom units all have a separate Living Room that includes a fully equipped mini kitchenette. Handicapped adapted rooms are also available. Please enjoy the oriental cuisine, exotic traditional Thai Food, Nightly display of the fresh seafood, cooked to your order with a complimentary salad bar. Open daily 06.30 a.m. till midnight . Specializes in Italian cuisine; innovative home made pasta, and unique wood oven pizza selections and more salad bar. Open daily from 03.00 p.m. till midnight . The Tandoor is air-conditioned and elegantly designed with strong flavours of india in the décor, subtle sounds of indian music, and delicious aromas from the kitchen. Resident chef, bal Krishna Amgain, joined Thara Resort & Spa with the sole purpose to open a quality Indian dining choice to Patong. The menu offers a variety of Indian dishes, and many tempting curries. We opted for chicken Tikka massala, mutton curry and aloo gobi. 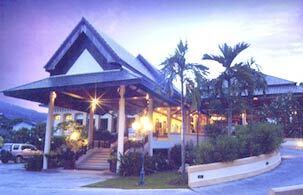 The Tandoor is located in Thara Patong Resort & Spa, on Patong's beach front. Enjoy the refreshment of variety of the world best ice cream and fresh home-made bakery and fresh brewed coffee. Open daily from 10.00 a.m. till midnight . Located on the ground floor of the building E. We serve a wide selection of Thai and Asia cuisine light meals, snacks and drinks. Open daily from 10.00 a.m. till 19.00 p.m.
One of the best place to relax and rejurenate during your day is “Thara Spa” where the serenity come along with the delicate incense, soothing oils and treatments including from traditional Thai massage. The special design and decoration are our proud invitaion.